This provides some exceptional food for thought regarding the khyāl gesture mapping challenge. Akten and team demonstrate powerfully that there is a sweet spot to be found between a direct mapping of body motion and a more abstracted visualisation. The multiple layers of material originate from the same physical motion, but have independence from each-other and from that motion. The original motion is, in a sense, providing the impulse that shapes the behavior of different systems. The resulting system behaviors don't just "track" the motion directly, but also clearly reflect the velocity and trajectory of that motion. These velocity patterns cause changes in the behaviors that echo past the time sequences that shape them. Like the "memory trail" one might have of the original motion, the systems emphasize that the dynamics of the motion have perceptual implications beyond the specific narrow windows where they occur. Because these layered systems both have their own behaviors and are impulsed by the same original motion, there is an engaging "counterpoint" arising between the different layers, all pointing clearly back to the character of the originating motion — even while that original motion has been eliminated from the picture. (I have a long-standing fascination with the idea that audio-visual complexes could achieve coherence due to their relationship to an underlying system that is neither audio nor visual and is not directly perceived). It is interesting that the left particle system helps emphasise the body mass and its distribution, while the other systems seem to emphasise more the trajectories of points on that mass. I find having both there quite compelling; they tell different aspects of the story. In the right-hand system, the spline curves seem to shift even after they have been drawn, perhaps even more so with wide arcs of high velocity. It seems likely simply that those points take on an initial velocity and trajectory and that velocity decays over time. Lovely idea. I'm still scratching my head a bit on the center system — though some kind of spring model seems at play. If one applies some similar techniques to the khyāl gesturing, it seems that there is a risk that the time independence of the visual systems could blur, rather than highlight, the motion-to-music relationship. But this is certainly worth experimenting with. Further, it is worth considering what other higher-order aspects (beyond velocity) in the originating motion could fruitfully be applied to shaping system behavior. Though I am intending to map the motions of Tofail Ahmed to an abstract visualisation, I want to ensure that important perceptual aspects of the body motion translate effectively. So it is helpful to analyze the performance motions. My intent is to identify high-priority relationships or parameters that I will seek to honour in the abstract visualisation. What "honouring" can and will mean in practice remains to be seen. Borrowing terms from Martin Clayton's study of gesture in Khyāl performance (2007), the performances I recorded of Mr Ahmed contained physical gestures that serve as "markers", "illustrators" and "emblems". Marker gestures indicate a specific time point in musical structure, such as beating a pulse, identifying a downbeat, etc. Illustrators appear analogous to the melodic flow/motion. The vast majority of the motion falls into this category. It is one vast territory that covers a lot that is very interesting — and very difficult to talk about analytically. This, perhaps, is precisely why it is so valuable! Emblems, or symbolic gestures, are more based on cultural convention and can be translated relatively readily into a verbal equivalent. An example would be indicating approval with a hand wave. Emblems would be the most problematic type of gesture given my intent. An emblem is at high risk of disappearing in an abstraction, given the very precise body-arrangement and audience reading it entails. Fortunately, there are very few emblems in the performance I am working with. The closest is an invocation-type emblem. This general position — palms close together, often in front of the face — is important. It creates the impression of focus and preparation, and occurs at the beginning of the first and last phrases of the performance. It also appears at the start of 11 other phrases of the 60 total phrases. This invocation emblem is also often acting as a marker of the start of phrases. It is doing dual duty. I am wagering that the element of proximity/closedness is as crucial here as the fact that this can be read as a sign of invocation/gathering. I am calling this the rest position. 27 of the 60 phrases start with the hands arranged in this general position. Five others are in closely related positions. Though there are true full-rest positions of hands on knees (at start) or hands in lap (at end), these seem like outliers that won't be useful as a base position, since none of the Illustrator gestures operate in those spaces. Given the above clues, I created some measures to help explore what body relationships might be highly correlated to the structure of the music. Basically, I am assuming that if my abstract visualisations at least clearly carry some of large scale articulators of phrasing, the details within will "take care of themselves". Finger Tip Proximity (FP) and Thumb+Finger Tip Proximity (FTP): The finger tips are in close proximity in both the invocation and the neutral position. So it could be of value to simply measure the distance between the finger tips. Plus, I took a more refined measurement of hand tip proximity is to take the distance between the finger tips and between the thumb tips, and average them. As it turns out, close finger tip proximity is often closely related to the beginning of phrases. However, finger tip proximity also closes in fairly often during other mid-phrase events. Shoulder to Hand Proximity (SHP): The close-to-body versus far-from-body contrast also seems important. As the arms straighten, hands move away from the body. So a simply measure of the degrees of far-from-body is the distance between the shoulder and the hand. This measure sums the left and right shoulder-to-wrist distances. Hand Closedness (HC): This sums the left and right finger-tip to wrist distances, to provide a measure of the open versus closed state of the hand. I could spend a lot of time now analyzing the relationships of these measurements to the music. But that probably will not actually help me attain my immediate goals, so I might have to set that aside for another time. Clayton, M. (2007) "Time, Gesture and Attention in Khyāl Performance". Asian Music v.38 n.2. This is a very simple mapping of the upper body motion of Tofail Ahmed as he sings an khyal alaap in raag Bhairavi. The spheres follow the middle finger and thumb endpoints, with the camera in the viewer position facing Tofail. Also, to smooth out issues I was having with sudden shifts in the thorax and pelvis rotations, I substituted in the head at the thorax point and made that the root. So the line is head : clavicle: humerus : radius : <hand : finger > <thumb>. An empty provides parenting to the root, and the empty is rotated 180° on each axis across the whole performance. This provides a foundation of slow, continuous motion to match, if you will, the fundamental drone. The head block, then, applies the rotations from the head as an offset to this base angle. I'm intrigued by the juxtaposition of the direct position mapping (the balls) with the hierarchical mapping (the planks). In the Fused Media Lab at De Montfort University's Faculty of Technology, I used a Vicon multi-camera infrared tracking system to capture the upper-body, arm and hand motions of Tofail Ahmed while he sang khyāl alāps. The software was Vicon IQ. IQ is no longer supported by Vicon, and its export formats are not widely recognized any more. 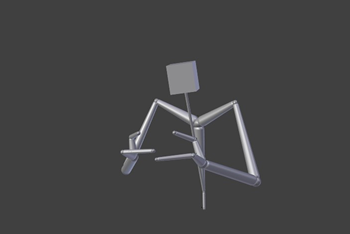 Therefore, I explored a multitude of dead-ends in trying to get the motion capture data into Blender 2.6x. Here's the solution I ultimately developed. One probably wouldn't want to go through this for high volumes of motion capture sessions for different subjects, but it is a reasonable solution for transferring one session. First, export the skeleton joint movement and rotations data from Vicon, using the CSV (comma separated value) format, global rather than local orientation. It contains world-space rotations and translations for each joint. The joint angles are Euler angles, specified by X Y and Z rotations in degrees, applied in that order (as they appear in the spreadsheet). Notice that the position of each joint is defined relative to its parent rather than in global coordinates. 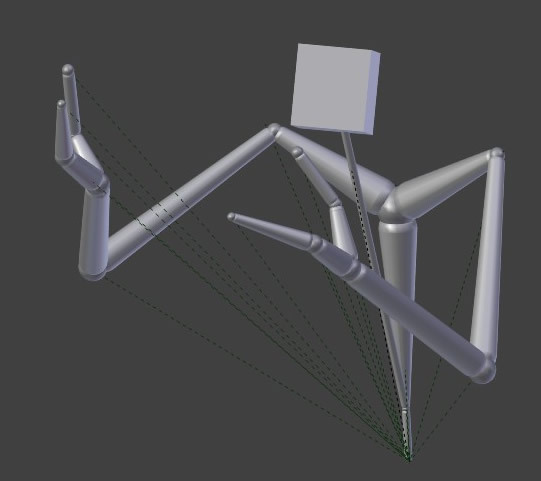 We will need global coordinates to create the skeleton in Blender. Further, the Vicon coordinate system is Y pointing left, X pointing back, Z pointing up, while the Blender coordinate system is X pointing right, Y pointing back, Z pointing up. So we need to map Vicon X to Blender Y, the negative of Vicon Y to Blender X, and Vicon Z to Blender Z. 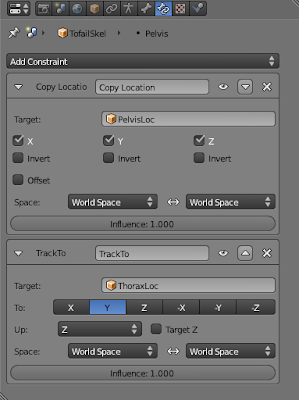 So, using these absolute/global values, one can create the skeleton in Blender. To be safe, I took care to ensure that the roll was set to 0 for all bones. 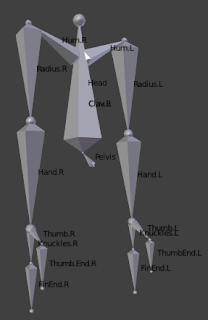 This skeleton will be huge by the standards of Blender units. Scaling will come later. … then I added second sheet and placed the search criteria for a filtering operation there. We want to select any row where FrameMod = 1. Notice in the formula bar that one has to enter ="=1" for this to work. Using Data > Advanced Filter…, designate "Copy to another location". The list range will be the range of the original data, criteria range will be the two search criteria cells, and destination should be a starting cell somewhere below the original data. The filtered data will appear here. The frame numbers will need to be resequenced. I copied frame numbers from the original data and pasted to the new, filtered data. I then deleted the FrameMod column. The header row (the row giving the names for each column) needs to be removed. Now save to a CSV file. I used the CSV F-Curve Importer v0_7_alpha1 to import the joint location data one joint at a time. Select a single joint-locator Empty and run the importer to keyframe its location. This will likely move the skeleton way off to some other location in Blender space, but it should now be animated. N.B. the above may not treat location of free joints (pelvis, thorax, and head in this example) precisely correctly. Comparing the global and local joint export files from IQ, I was not able to come up with a consistent interpretation of how to handle these. For example, it seems to me that free joints below the root joint imply variable bone-lengths, which does not make much sense to me – and I suspect can't be implemented in Blender. However, the above worked well enough for my purposes. So we are able to get this far without having to import any actual rotation data. The head provides an exception. We now know its location, but not its rotation. This will need to be imported from the Global CSV. But this requires some more prep. The Vicon CSV is in angles, but Blender's internal routines work in radians (even if the interface displays degrees). So the CSV angle data needs to be converted to radians. One way to do this is to copy the column of data to another spreadsheet. Then fill the next column with an =RADIANS formula. Select and copy the resulting numbers, and paste over the data in the original spreadsheet using Paste Special > Values. Select the Head locator empty and run the F-Curve importer to import the X Y & Z rotations. As with the translation import above, these should be indexed 1 0 2 in order to swap the X and Y axis. 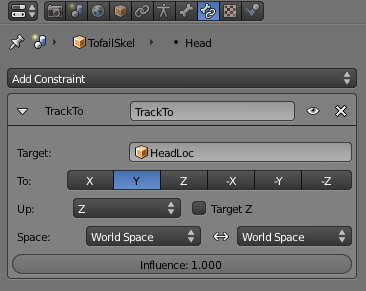 In my case, it made sense to add a block to represent the head, and add a Copy Location constraint and Copy Rotation constraint, both tied to the Head locator. I created an empty at the exact origin of the pelvis, then parented all locator Empties, the head block, and the skeleton to this Empty. This empty serves as the root of the whole bundle, providing one point of control for positioning, rotation and scaling. 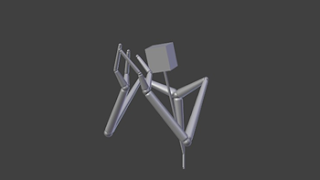 A scale of 0.01 brought my figure down to something closer to normal Blender working scale.